Across the 25 countries surveyed, a median of 45% have a favorable view of China while 43% hold an unfavorable view. Majorities or pluralities in 12 countries give China positive marks. Positive views of China are most prevalent in Africa, the Middle East and parts of Asia. More than six-in-ten in Tunisia, Kenya and Nigeria view China favorably, as do roughly half or more in South Africa and Israel. More than half in Russia, Indonesia and the Philippines also offer positive opinions of China. Economic ties spurred by the Belt and Road Initiative, including the fact that these three nations are among the top receivers of Chinese construction contracts, may partly explain the sanguine attitudes toward Beijing. In Latin America, at least four-in-ten hold positive views of China in Brazil, Mexico and Argentina. However, sizable minorities in each country say they regard China in a negative light or offer no opinion. Views about China differ substantially across the Asian nations surveyed. Japanese register the most negative views of China (78% unfavorable), followed by South Koreans (60%). Australians are split almost evenly (48% favorable vs. 47% unfavorable), though positive views have dropped by 16 percentage points since last year amid concerns of growing Chinese influence in Australian businesses and universities. In Europe, a median of 42% across 10 countries express a positive opinion of China, while slightly more (48%) are negative toward Beijing. Only in the UK does a plurality give China a favorable review. The Netherlands, Hungary, Greece, Spain and Poland are generally split on their opinions of China. Half or more in Italy, Germany, France and Sweden say they have an unfavorable view of the Asian giant. The United States and Canada have mixed feelings when discussing China. Canadians display an almost even divide, with 44% viewing China favorably and 45% holding an unfavorable view. In the U.S., 38% of Americans have a favorable opinion of China, a slight decrease from 44% in 2017, while nearly half express unfavorable attitudes. In a few countries, younger citizens have significantly more positive views of China than their older compatriots. The largest such difference occurs in the UK, where 61% of younger Britons hold a favorable view of China compared with 43% of those ages 50 and older. Gaps of at least 10 percentage points also exist in the U.S. (15 points), Australia (12 points) and the Netherlands (11 points). A median of 66% across 25 countries think the Chinese government does not respect the personal freedoms of its people. This survey took place amid initial reports that up to 1 million Uighurs, a Muslim ethnic minority in Western China, have been sent to government-run re-education camps, but before United Nations human rights experts released a lengthy report criticizing the Chinese government’s handling of the situation. Beijing has disputed these allegations. Publics in Europe, Canada, the U.S. and parts of Asia overwhelmingly believe China does not respect personal freedoms. Majorities in every European country say China violates its citizens’ civil liberties, with more than eight-in-ten holding this opinion in Sweden, France, the Netherlands, Germany and Spain. Similarly negative sentiment can be found in the U.S. and Canada. Israel also views China as a nation that does not uphold personal freedoms, with nearly two-thirds expressing this view. Tunisia holds the opposite opinion, with nearly seven-in-ten giving China high marks on civil rights. In Asia, sentiment is somewhat mixed. Strong feelings that China does not protect the rights of its citizens dominate in Japan, Australia and South Korea. However, more than half in the Philippines and Indonesia hold the opposite view, saying China does respect citizens’ rights. The three sub-Saharan African nations surveyed give China relatively high marks in defending civil liberties, with half or more voicing this opinion. Brazil, Argentina and Mexico take the opposite view, with at least half in each nation saying China impinges upon the rights of its citizens. Among Russians, about half say personal freedoms are respected in China, 26% say they are not and 22% offer no opinion. The view that China does not respect the personal freedoms of its citizens is strongly correlated with overall negative views of China. 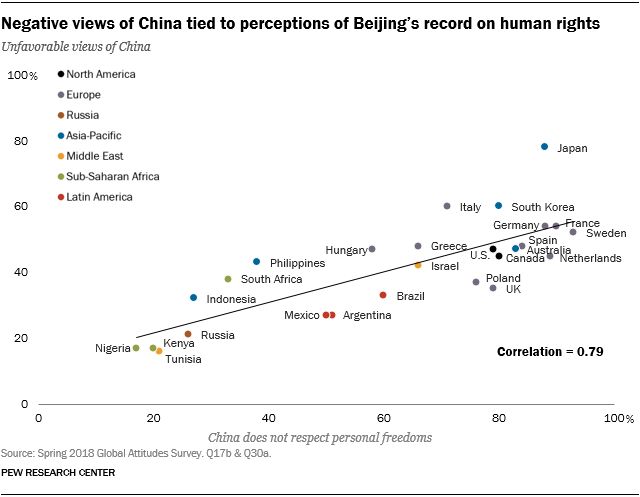 Countries where more people say China ignores the rights of its people tend to have more unfavorable views of China, while publics less critical of China’s human rights record also show lower unfavorable opinions of China overall. Japan is the outlier, showing higher levels of general dissatisfaction with China that may relate to historical and political strains in bilateral relations.